Everyone looking for a job in aviation will sooner or later be confronted with pilot aptitude tests. These tests consists of a set of psycho-motor and psycho-technical tests in the fields of computerized pilot tests, verbal reasoning, mathematics and physics. They are compliant with the standards used by all flight schools and major airlines during pre-hiring screening and give you a perfect idea on what to expect when applying for a job in aviation. The content and information used on this website should only be used for preparation purposes. We are an independent web site and is not affiliated and have no commercial connection with any flight schools or airlines. This test assess your english skills. For example, "Which group of letters can be reordered to spell the word gear?" On the screen you will then see 3 groups of jumbled up letters - e.g. arqe, rgae, eeager. Only one of these can be re-arranged to correctly spell the word gear.. This test features a practice sectin and test section. the test section consist of easy, medium and hard level. Scores will be calculated based on your performance. The purpose of this test is to measure your hand-eye coordination and spatial awareness. The goal is to keep the red dot centered. The dot itself will constantly be changing direction, so you should always be anticipating the next movement. Red Do Test features 3 different levels (easy, medium and hard). Each level has a time limit. At the end of the test, a score will be provided based on your accuracy in the airplane on track. This test measures your psychomotor and multitasking skills. You will be flying an airplane by either using a joystick or computer keyboard keys. While flying the airplane you have to solve math, IQ, Verbal and numerical questions. You also need to pay attention to Air Traffic Control instructions and maintain an accurate spatial orientation. The Flight Test consist of 20 minutes. Scoring will be based on how accurate you navigate and answer the questions during flight. Advanced Flight Simulator assesses various pilot aptitudes, ranging from hand-eye coordination and situational awareness to cognitive abilities, multi-tasking and stress tolerance.. This test consist of 15 minutes and is divided into three rounds. 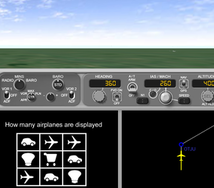 Scoring will be based on how accurate you navigate and answer the questions during flight. Both short-term memory and tolerance for stress will be assessed in this simulation. You will constantly be confronted with new information and images and asked to memorise and reproduce this information. Working Memory features 3 different levels (easy, medium and hard). Each level has time-limited rounds in which you have to memorise the information and answer each question correctly. At the end of the test, a score will be calculated.